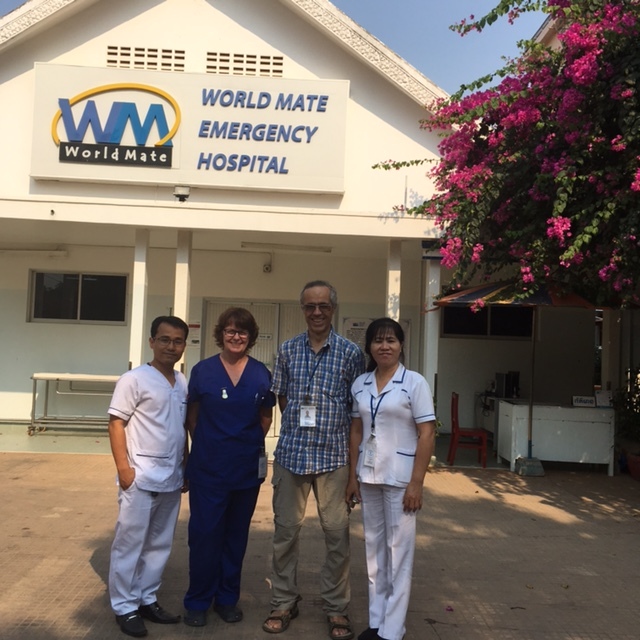 World Mate Emergency Hospital in Cambodia have been collaborating with us since 2016 and have already contributed 38 patients into the CRASH-3 trial. PI Simon Stock tells us how the trial is running at the hospital and how he and his team make efforts to recruit patients as quickly as possible into the trial. I have the benefit of working in a small trauma hospital where I know all the nursing and medical staff. We have a small emergency room where patients are assessed on arrival at the hospital (there is no ambulance service so they come by car, taxi or Tuk-tuk). We get no advance warning of the arrival of a patient. However, as we have been involved with the CRASH-3 trial for some time, everyone in the emergency department knows about the eligibility criteria (we also have a poster displayed as a reminder) so as soon as a potentially suitable head injury patient arrives the duty doctor phones me. After a 30 second phone conversation to confirm that the patient is likely to be eligible for the trial, I go straight to the emergency room, unless I am already operating or otherwise unavailable. If I am at home it takes me about 10-15 minutes to get to the hospital and a further 2 minutes to assess the condition of the patient and confirm eligibility. We rarely have the relatives available immediately so we use the consent waiver and the patient is entered into the trial within 5 minutes of my arrival. Our treatment boxes are kept in the emergency room in a locked cupboard to which I have a key, so we can get the loading dose started within the next few minutes. The patient does not leave the emergency room until they have been assessed for the trial. So worst case scenario (middle of the night) it takes me under 25 minutes to initiate treatment from being contacted and best case (I am in the hospital) it takes less than 10 minutes. I could not complete the initial assessment so quickly without the co-operation and willingness of all our staff.